I have always been in awe of the various memorial sites around Europe from WWII. I am a veteran and have spent some time in dangerous places, but I find it very hard to imagine the world as it must have been for these men that made the ultimate sacrifice. Just a few months ago I became aware of the possibility of adopting one of the graves. I visit the grave regularly and make sure he is remembered even though I am missing any details such as: what he looked like? where he grew up in Washington? does his family know where he lays? how he died? where he died? 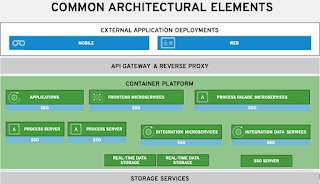 etc? More pictures of PFC H.L. Hooper grave site. I will continue to dig, trying to find out more about his time between enlistment and up to his passing. If you have any information, please feel free to contact me through this site. 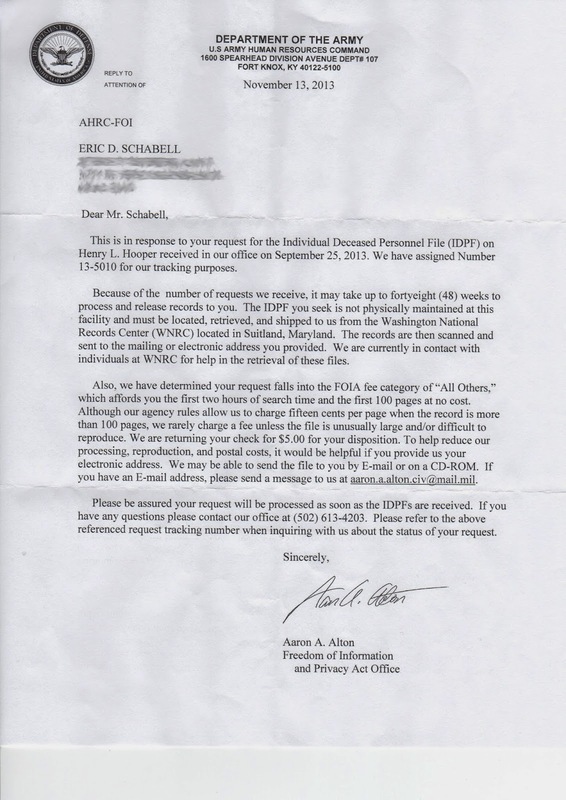 Received an envelope postmarked July 11th, 2014 from the Department of the Army Human Resource Command in Fort Knox, Ky with two files (scanned images) of the IDPF for PFC Henry L. Hooper. 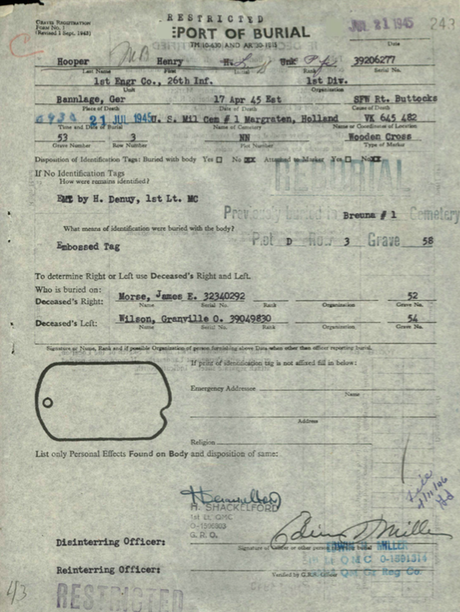 A Disinterment Directive dated 27 August 1948, most likely he was moved to the final plot location where he is now located. "It was my son's expressed desire to be buried where he fell, so please leave him where he is if possible." The letter sent to Mr. Albert H. Hooper (father) notifying that his son was permanently interred at Margraten, dated 25 February 1949. The letter dated 4 December 1947 that was sent to Mr. Albert H. Hooper (father) notifying that his son was to be disinterred from Margraten plot NN, row 3, grave 53 and moved to his final resting place. Mr. Albert H. Hooper is asked to reply with his wishes for the disposition of the remains. A letter dated 15 November 1946 that was sent to Mr. Albert H. Hooper (father) to notify him of the exact location of his son in Margraten, plot NN, row 3, grave 53. 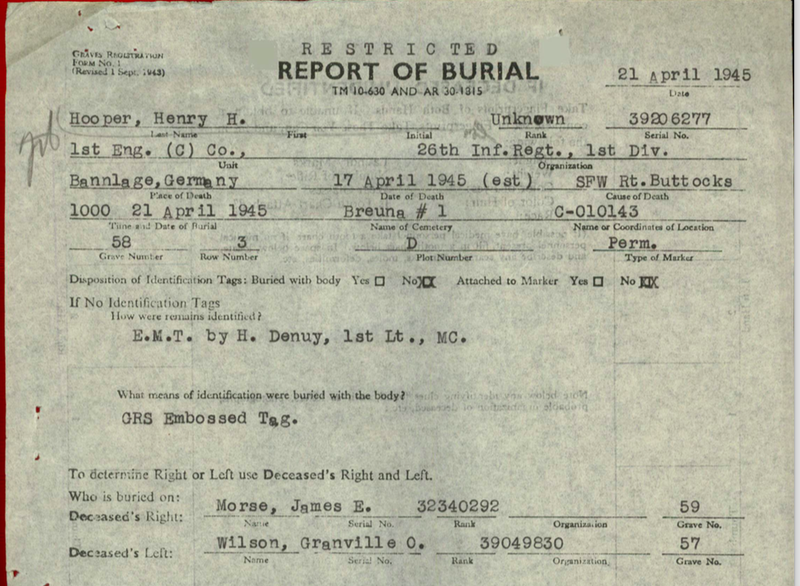 Burial report PFC Henry L. Hooper in Germany. Mr. Andrew B. Hooper (grandfather), 131 Blakely St., Monroe, WA. Mr. Albert H. Hooper (father), 131 Blakely St., Monroe, WA. Summary Court-Martial dated 25 August 1945 in which PFC Henry L. Hoopers personal effects where decided as passing to next of kin (father). Letter dated 11 October 1945 to Mr. Albert H. Hooper (father) that personal effects of his son were sent on 30 August 1945 but were returned in the post because of illegible address. The Army re-forwarded them again. Letter dated 25 August 1945 to Albert H. Hooper (father) stating that his sons wrist watch was being sent to him at 131 Blakely St., Monroe, WA. The second file on the CD was a letter from the Department of the Army stating that this was all the information they possessed. Contacted by a Mrs. McCarthy and her son who live in Monroe, WA. and are working on a school project to research and honor their towns WWII fallen. 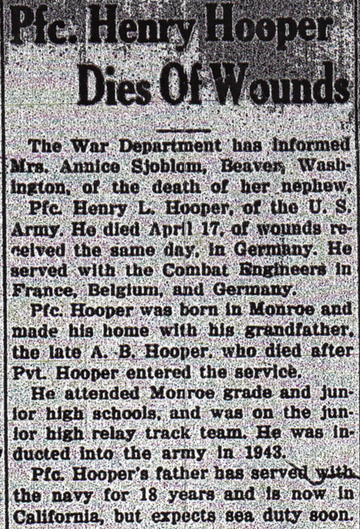 They have found the following article in the local Monroe Monitor newspaper archives from 18 May 1945 listing the death of PFC Henry L. Hooper. Through this she put me in contact with a son of one of Henry L. Hoopers cousins, who provided this family photo from 1927 shot in or around 1927 with Henry L. Hooper sitting on the stairs as a boy. 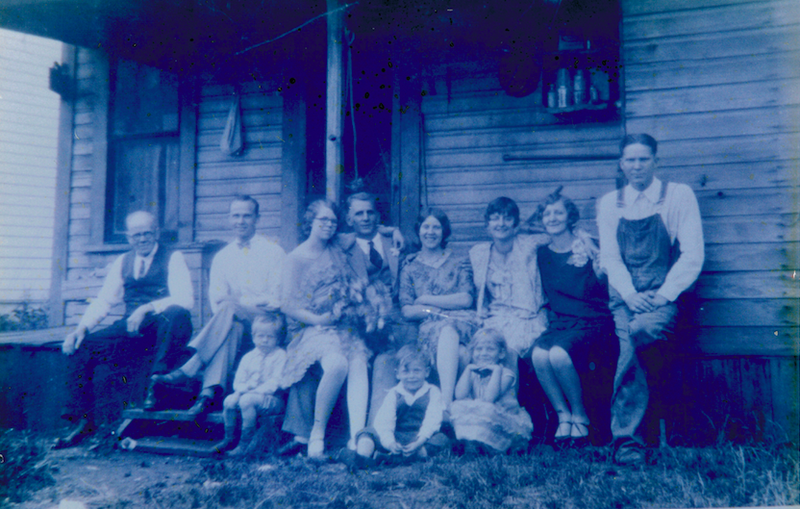 Albert H. Hooper top left (taken in or around 1927). Henry Leo Hooper was one of the 18 causalities of World War II from Monroe. He was born on September, 9th 1924. Shortly after he was born, his mother left him in the care of his father Albert Henry Hooper. 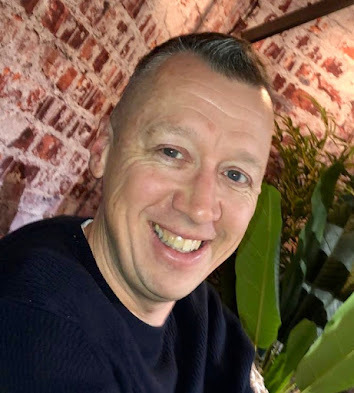 His dad served in the Navy for 30 plus years so growing up Henry had to live with his grandparents Andrew Bowman Hooper and Alice Tippet Hooper. He completed grammar school which is typically 8th grade and was part of the relay track team. After he completed school, he was trained to be a mechanic. Henry was a short man at 5 foot 3 inches tall and weighed about 150 lbs. He was drafted and enlisted on April, 9th 1943 at the age of 18 into the Army. His enrollment was for the duration of the War or other emergency, plus six months, subject to the discretion of the President or otherwise according to law. He was a Private First Class and served in the First Engineer Company 26th Infantry 1st Division. He served with the combat engineers in France, Belgium, and Germany. On April 17th 1945, with only two years of service under his belt, he died of shell fragment wounds to the right buttocks during a battle in the vicinity of Schierke-Braunlage, Harz Mountains, Germany. The only personal effects returned to his family was one wrist watch. Awards received by Henry included the Bronze Star, Purple Heart, European African Middle Eastern Campaign Medal, World War II Victory Medal and World War II Service Lapel Button. 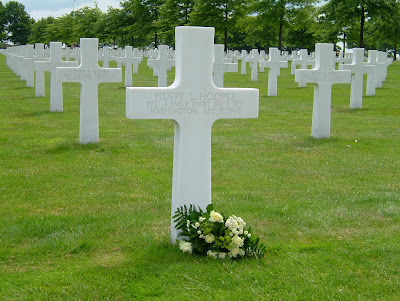 As a result of my search for more information on Henry, I found that his grave had been adopted by Eric D. Schabell a former United States Marine who lives in the Netherlands. I was able to contact Eric and provide more personal information about Henry’s life prior to his military career. Eric visits Henry’s grave at least once a year. Local Monroe Monitor article on the presentation and research done by the local kids. 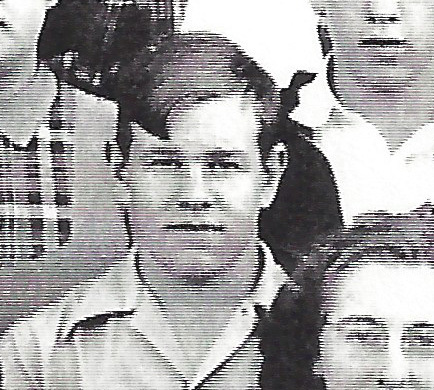 A photo from Henry L. Hooper's 8th grade class was obtained by Charla McCartney, verified by his cousin Ray Sjblom during her research and forwarded to me. Photo added to top of this page. There was a ground breaking ceremony in Monroe, WA for a monument to veterans which is to include Henry L. Hooper, article in local Monroe Monitor.